Located 2.5 blocks from the French Quarter, this New Orleans hotel is one mile from the Ernest N. Morial Convention Center. It offers rooms with European furnishings and original artwork. Queen & Crescent Hotel features the relaxing Club Car Lounge. Guests can also enjoy the 24-hour gym. A light continental breakfast is served every morning. Guest rooms at the Queen & Crescent offer free Wi-Fi and safety deposit boxes. A coffee maker and ironing facilities are also included. The helpful staff at the Crescent Hotel can arrange city tours, riverboat cruises, swamp adventures and plantation excursions. Queen and Crescent Hotel, Overview. Find the lowest rate for the Queen and Crescent Hotel in New Orleans, Louisiana at KAYAK. 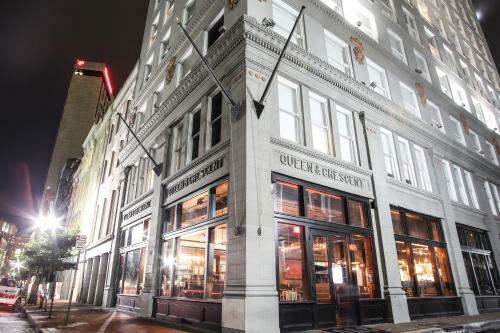 Located 2.5 blocks from the French Quarter, this New Orleans hotel is one mile from the Ernest N. Morial Convention Center.